In small bowl whisk all the salad dressing ingredients together, cover and refrigerate. 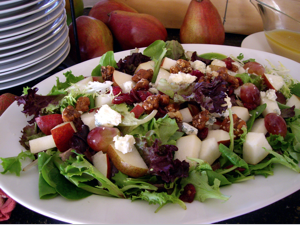 In large salad bowl combine baby greens, pears and grapes. Garnish salad with blue cheese, walnuts and cranberries. When ready to serve toss salad with dressing and enjoy!